Farm income, mostly earned by the nation’s feudal ruling elite, accounting for about 20% of the GDP is entirely exempt from any income tax under the law. Only about2 million of 180 million Pakistanis pay income tax. Of them, 1.8 million are salaried and paid Rs.27.37 billion in taxes during ended fiscal 2008-09, according to a report to the Senate by Minister of State for Finance and Economic Affairs Hina Rabbani Khar. The government runs large current account deficits, forcing it to beg and borrow to meet the budget needs. The budget deficit for2008-09 was 4.3%of GDP and it is likely to grow with lower revenue amidst slowing economy in 2009-10. The tax evasion in Pakistan is estimated atRs500 – 600 billion a year, almost half of the total tax collection of about Rs1200 billion during 2007-08. 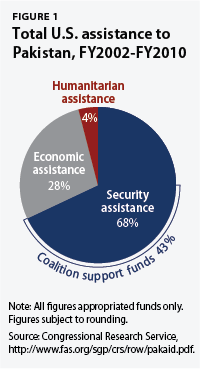 The untapped amount is almost equivalent to the country’s annual budget deficit. In a country where majority of the transactions, including purchase of big ticket items, occur in cash, there is widespread tax evasion and a sizable informal economy. The estimates for Pakistan’s underground economy vary from 25% to 50% of the formal economy. 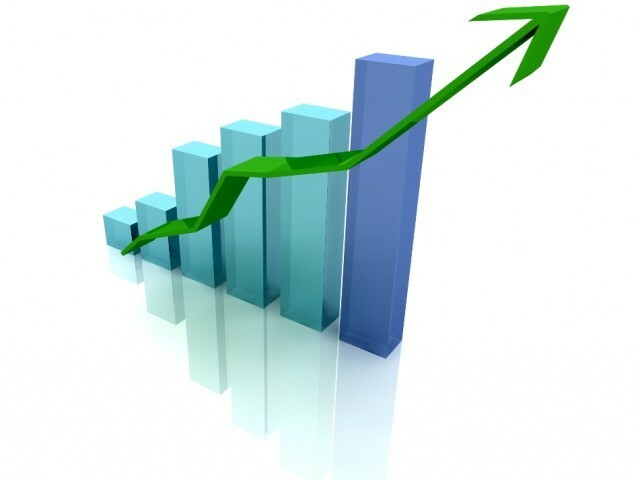 A recentWorld Bank (WB) report concluded that every Pakistani citizen evaded tax amounting to Rs 4800 in the year 2007-08, while the total tax evaded in the period stood at Rs 796 billion. The PPP leadership is not alone in evading taxes. The PML leadership appears to be just as guilty. The entire Sharif family paid a nominal income tax of Rs 250,000, wealth tax of Rs 550,000 and agriculture tax of Rs 130,000, considering their vast assets and properties of at least 23 sugar and textile mills and huge agricultural land, according to the News. The tax evasion by the Sharif family was the reason that the donor agencies giving aid to Pakistan in late 1990s insisted on publishing tax records of all lawmakers and senior bureaucrats, The News said, adding that for this reason, the donor agencies insisted on broadening the tax net to prop up government revenues. When you’re an entrepreneur, who inevitably wears many hats, managing your time can get tricky—especially when it’s tempting to work all day to grow your business. But being successful doesn’t mean being a slave to your work. Below, four accomplished entrepreneurs share their productivity strategies and how they overcome potential obstacles. 1. They’re clear about their priorities. Bregman, who’s also author of 18 Minutes: Find Your Focus, Master Distraction, and Get the Right Things Done, knows how to use his time. He recommended readers be strategic “about the highest and best use of their time and make discreet, specific decisions about how you are going to spend each hour.” If you don’t make deliberate decisions about your day, “it’s almost impossible not to let distractions carry you away,” he said. 3. They begin the day with enjoyable activities. Professional life and career coach Kristin Taliaferro believes that starting the day off on your own terms is key to productivity. “If you begin your day checking email, for example, you’re at the mercy of everyone else’s agenda and that can absolutely shape your day and cause you to be unproductive with your goals,” she said. Taliaferro, who also believes multitasking is rarely effective, tries to schedule back-to-back phone appointments in the mornings and later focuses on writing projects or responding to email. Brittni Melhoff, founder of papernstitch.com, a curated exhibition site for artists and makers to showcase their work, and editor of thepapernstitch blog, suggested readers try the pomodoro technique. “It will help you manage your time by breaking your day down into 25-minute intervals, so you can focus on just one task at a time,” she said. 5. They batch tasks weekly. Melhoff schedules “different reoccurring tasks for different parts of the week,” such as writing blog posts on Mondays and marketing and client work on Tuesdays and Wednesdays. “I find it really helps to keep my mind focused on one topic for the day, whenever I can, so that I don’t drive myself crazy with every tiny little thing each day,” she said. Similarly, Taliaferro sometimes “set[s] aside an entire day [to wrap up] ‘loose ends’” for her business. 6. They keep their energy up. She also makes sure to eat healthfully, exercise, get enough sleepand engage in other self-care activities. “This helps me feel strong and centered when I’m actually working,” she said. “I try to be totally focused on whatever I’m doing, whether it’s listening to a client or returning an email,” Taliaferro said. To facilitate this, she tries to eliminate potential distractions. For instance, when she’s writing, she turns off the phone ringer. “When you’re very present, it’s actually pretty relaxing. When you’re relaxed, you can get more accomplished,” she said. 8. They take full days off. Entrepreneurs can easily get burned out. According to Carol Tice, a fulltime freelance writer who writes the award-winning blog Make A Living Writing, taking at least one day off a week “is probably my biggest productivity tip.” She always takes Saturdays off and stays completely offline. On Sundays, she works for several hours so Mondays aren’t so hectic. Tice, who used to be an executive secretary, believes that her ability to track “information, deadlines and projects” also is important for her productivity. For instance, she’s recently started using a program called Freshbooks to keep records and bill clients, which has saved a lot of time. 10. They tackle tasks they’re passionate about. Naturally, it’s easier to be productive when you’re passionate about your projects. So, Tice, for instance, works on what she’s “hot to do [that] morning. “I’ll often do that, even if it doesn’t appear the most pressing priority. What you’re in the zone to do goes fast, as opposed to forcing yourself to do something you’re not in the mood for,” she said. Taliaferro also finds that when she’s working on enjoyable tasks, “time flies by so I’m more productive and happier.” She’s able to do this because she tries “to outsource tasks as much as possible” and has a virtual assistant. 11. They don’t waste time. “I don’t have a lot of time-wasting stuff in my life like watching TV or playing on Facebook,” Tice said, who spends just several hours a week on these kinds of activities. 12. They take it easy. Entrepreneurs tend to set high standards for themselves, which is one of the reasons they’re so successful. But there’s a flip side: If you don’t accomplish your goals, you feel like a failure. These entrepreneurs also deal with a variety of obstacles. Here are several pitfalls along with their pointers for overcoming them. Having a lot of work. Tice’s biggest obstacle, she said, is her “tendency… to skate at the dangerous edge of being overbooked.” Because she enjoys cultivating her skills, Tice often picks projects “a little outside my comfort zone.” This creates a time crunch and can lead to missing deadlines. Reducing how much you worry about and procrastinate over a task also “free[s] up a lot of time and energy,” she added. SINGAPORE: High Commissioner of Pakistan to Singapore Syed Hasan Javed said that Pakistan was the next economic success story of Asia due to development in various sectors. He said a number of indicators, such as rising female education, growing empowerment of women in society, boom in the rural economy, rise in worker’s remittances and increase in exports showed that Pakistan will be Asia’ success story in the near future. Javed said that Pakistan just required economic reforms and a better governance system. He said Pakistan had a reasonable infrastructure, legal system, English language education already in place and enjoyed advantages of young population and rich resource endowments including holding countless mineral reserves, tourist potential landscape, enviable location advantage and vibrant agriculture sector. He said that Pakistan was the world’s major untapped market, which enjoyed excellent relations with all the world’s major powers and countries. Pakistan was attracting interest of more and more companies in the Asia-Pacific region which planned to relocate to Pakistan for business, he added. Javed said interaction with foreign correspondents was part of the interactive initiative by the high commission to project the soft image of Pakistan and its growing importance as an investment destination for the companies of the Asia-Pacific region. Published in The Express Tribune, November 17th, 2012. New York, December 7, 2012 –– The Partners for a New Beginning (PNB) Secretariat at the Aspen Institute organized a roundtable discussion on Entrepreneurship and Investment in Pakistan with Morgan Stanley and Abraaj Capital. Over 75 representatives from the US Government, the Government of Pakistan, the private sector and the NGO community convened on 3 December 2012 at Morgan Stanley’s New York City offices to discuss opportunities for entrepreneurship and investment in Pakistan. While news reports from Pakistan often focus on violence and corruption, Pakistan has quietly become a potential investment location due to its strong middle class – the fourth largest in Asia – and its energetic entrepreneurial climate. Throughout the evening, the conversation highlighted leaders from the private sector, the US and Pakistani governments, and the impact investment community to share success stories and lessons learned for investing in this growing market. PNB Steering Committee member, Morgan Stanley, who hosted the event, spoke of the company’s commitment to PNB and its model of engagement. They gave special emphasis to their Global Sustainable Finance unit, which includes Investing with Impact, an initiative that was launched earlier this year at a US State Department event. “This event exemplifies how PNB is bringing together the public and private sector to implement the vision of supporting economic development in countries with Muslim-majorities, and creating new connections between these countries and the United States,” said Mahmoud Mamdani, Vice Chairman for the Middle East and North Africa and Managing Director at Morgan Stanley. “Capital markets can and should play a critical role in helping strengthen communities and providing sustainable economic opportunity,” said Morgan Stanley’s Head of Global Sustainable Finance Audrey Choi. Focusing on opportunities in the small and medium enterprise sector, Abraaj Capital’s Tom Speechley spoke of why his firm is so bullish on the market in Pakistan. Mr. Speechley, who is the CEO of Abraaj’s small and midcap investment arm – Aureos Capital, highlighted Pakistan’s competitive ICT labor market, its encouraging investor protection track record, and its favorable comparability with other BRIC countries. He also discussed successful projects undertaken so far by Abraaj in Pakistan such as KESC, MSF, and Biogas. Representing the views of the private sector, CEO of NTELX the Hon. Rob Quartel, MIT Sloan professor and founder of the MIT Enterprise Forum Imran Sayeed, and CEO of ConstellationCK/Sofizar Carlos Cashmanshared their experiences in Pakistan. “A business like mine would have been very difficult in the US, but we can do it in Pakistan because the cost is so much lower,” said Mr. Cashman. The people of Pakistan are “natural capitalists,” added Mr. Quartel. From the US government, the State Department’s Deputy Special Representative for Afghanistan/Pakistan Dan Feldman discussed trade-focused collaboration between the US and Pakistan. Alex Thier, Assistant to the Administrator for the Office of Afghanistan and Pakistan Affairs at USAID, spoke about the Pakistan Private Investment Initiative, a public-private partnership aimed at generating investments in Pakistani companies in partnership with the private sector. “The Department sees business leaders as change agents,” Mr. Feldman remarked. Other speakers included Harris Mehos, a Director in the Structured Finance group at the Overseas Private Investment Corporation (OPIC), discussed some of their operations in Pakistan, and former International Finance Corporation Javed Khan shared his observations on some of the steps the Government of Pakistan can take to better encourage investment. Shuaib Siddiqui from Acumen Fund discussed his organization’s approach to poverty alleviation, while Invest2Innovate’s Kalsoom Lakhani spoke enthusiastically about why her group is piloting its business accelerator site in Pakistan. Partners for a New Beginning (PNB) is a network working in ten countries where local projects and priorities are identified by local chapters. PNB strategically matches them with US and international partners. The Aspen Institute serves as the PNB Secretariat and is responsible for driving, expanding and sustaining the PNB network. The Secretariat maintains communication between stakeholders, identifies strategic partners and brokers partnerships that support project development and expansion. For more information, visitpartnersforanewbeginning.org. The Aspen Institute is an educational and policy studies organization based in Washington, DC. Its mission is to foster leadership based on enduring values and to provide a nonpartisan venue for dealing with critical issues. The Institute is based in Washington, DC; Aspen, Colorado; and on the Wye River on Maryland’s Eastern Shore. It also has offices in New York City and an international network of partners. For more information, visitwww.aspeninstitute.org. The Embassy partnered with the U.S.-based Kauffman Foundation, the largest foundation dedicated to promoting entrepreneurship in the world, to carry out these workshops in celebration of “Global Entrepreneurship Week” ─ the State Department’s global celebration of the innovators who bring new products and services to the marketplace. The United States works with Pakistani universities and partners in the private sector to promote the growth and development of entrepreneurship. In addition to workshops with Abasyn University, the U.S. has worked with the National University of Sciences and Technology to establish business incubators, helping telecommunications and alternative fuels entrepreneurs launch their companies in Pakistan. This initiative is just one part of a comprehensive U.S. economic assistance program which creates jobs and boosts incomes with projects that expand Pakistan’s agricultural output, build roads to facilitate trade, and offer a private equity fund to help small- and medium-size businesses grow. During a weeklong series of workshops sponsored by the U.S. Embassy and held at Abasyn University, the United States is helping talented Pakistani entrepreneurs sharpen their business skills, bring new products and services to market, and achieve profitable growth. This week, more than 720 aspiring Pakistani entrepreneurs attended the workshops to learn the nuts and bolts of running a successful business and to pitch their business ideas to potential investors from the United States. Who will pay for Pakistan’s state? The scheme is the brainchild of Pakistan’s tax chief, Ali Hakeem, head of the Federal Board of Revenue (FBR) since July. His computer boffins have spent the past few months trawling data—not to find out how much people earn, but rather to unearth their spending patterns and lifestyles. The FBR has come up with 1,700 variables that predict a person’s tax liability. Some clues are obvious, such as foreign travel, owning a house in a posh neighbourhood and big-ticket purchases such as cars. Others are ingenious. It turns out that having a weapons licence is an excellent indicator of wealth. The FBR’s analysis also shows that married men are richer than single men. Men with two wives are richer still. However, men with four wives (the maximum allowed to Muslims in Pakistan) are often poorer than those who have only one. Many people escape paying taxes by simply bribing the tax inspectors who call on them, Mr Hakeem admits. “We want the computers to be the enforcers,” he says. The exercise has identified around 3m people who should be paying tax. Under the plan, these people will be served notice and given 75 days to comply or they will face punishment. But if the FBR can identify the dodgers, why can it not pursue them for the full amount they owe? The tax board says it wants to use its new data fast, before a possible change of government jeopardises the scheme. There is no time to calculate the evaders’ full liabilities. Mr Hakeem believes the system is so rotten that, in effect, it offers an amnesty to almost everyone anyway. 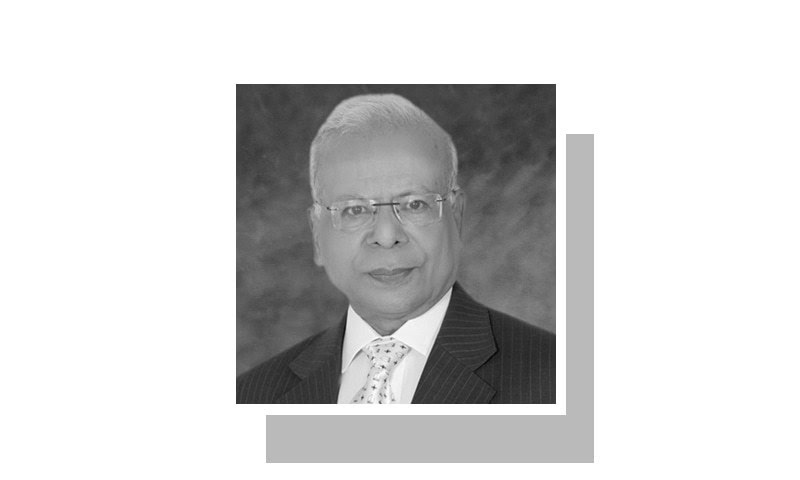 But cynics worry that the oily businessmen and back-room fixers who have prospered over the past four years of PPP government will use the scheme to legitimise their ill-gotten gains. It is “a way of laundering your money”, says Hafeez Pasha, a former finance minister. Amnesties, which have failed in Pakistan in the past, create perverse incentives. They alienate taxpayers otherwise disposed to being honest, who may decide to stop filing and wait for the next such offer. At best, the amnesty will bring in another 0.5% of GDP in revenue, Mr Ahmad suggests. At worst, revenues may fall. Both Mr Pasha and Mr Ahmad argue that more fundamental reform is required. Many people fail to pay taxes because they are not legally obliged to do so. Agriculture is exempt from federal income tax, largely because parliamentarians are either large landowners or dependent on rural votes. Mr Hakeem’s board has the power to exempt products through regulatory orders without the approval of parliament. One such order, dated April Fool’s Day, 2011, made a mockery of the country’s sales tax, imposing a 0% rate on 184 items, including carpets, buttons and the willow wood from which cricket bats are made—as well as “any other goods as may be specified”. 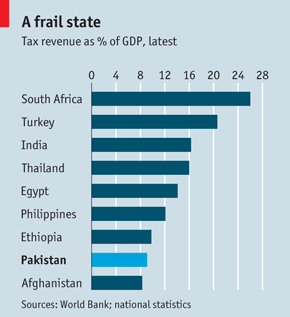 Mr Hakeem’s number-crunching may help plug some leaks in Pakistan’s tax bucket. But his board has already poked hundreds of legal holes in it. Pakistan promised to abolish loopholes in 2008 as one of the conditions for a generous IMF loan of $11.5 billion. Yet it failed to do so. It also promised to remove the tax board’s discretionary power to create loopholes. But punching holes in the tax code is a handy way to “win friends and influence people”, Mr Ahmad says. A low tax take breeds problems. People who might otherwise pay their taxes wonder what services they will get in return. Federal revenues are swallowed up by debt servicing, defence spending and power subsidies, with no room for much-needed spending on health, education or welfare. A constitutional amendment passed in 2010 gave the provinces clearer responsibility for such programmes. But the provinces lack a reliable tax base of their own. 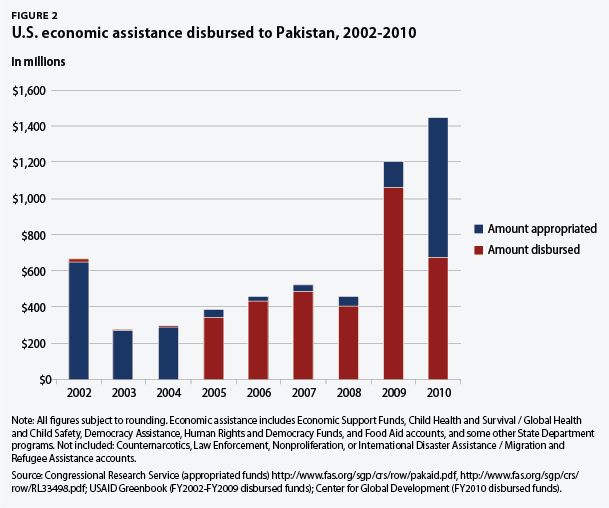 In the latest fiscal year, Pakistan spared only 0.3% of GDP for health. Despite such miserliness, Pakistan’s budget deficit still exceeded 8% of GDP last year. The government has bridged the gap by borrowing from the central bank and the banking system (which itself borrows heavily from the central bank). This has crowded out private borrowing and ushered in inflation, projected by the IMF to return to double-digit rates by the middle of next year.